Each of the items you can review on the All Content page is brought into the plugin via RSS or Twitter feeds. In addition to monitoring these items, we also strongly encourage you to draw on your own knowledge of sites and posts relevant to the field to nominate content that we may have missed. You can do this using the “Nominate This” bookmarklet. Instructions for using the bookmarklet are at the bottom of this page. 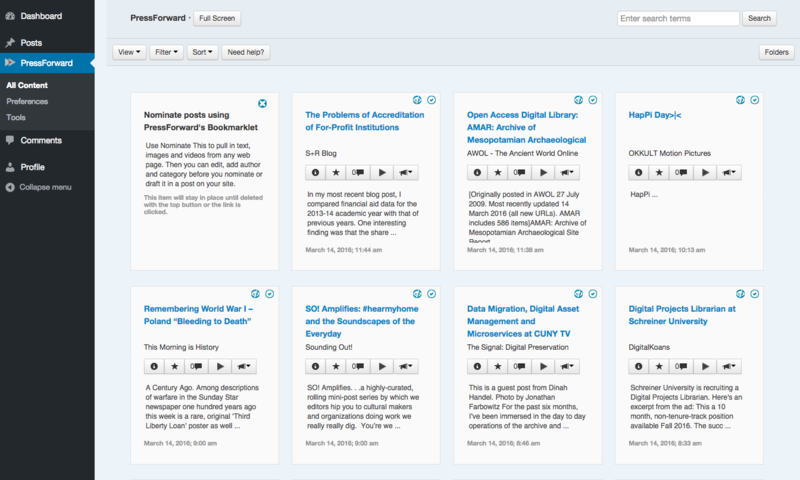 You will find the All Content page in the “PressForward” tab along the left hand side of the screen. Clicking either “PressForward” or “All Content” in the menu that appears will open All Content for you. There are two main ways to read the items in All Content. The default view is the “snippet” view above, where you can see the title, author, and the first 100 characters of each post. As you scroll down the page, additional items will load. You can also switch to a “list” layout by selecting “list” from the horizontal navigation above the feed items. Here, you can read the item, link to the original site of publication, or leave a comment for the editors. If you want to go back to the initial view, use the “X” in the top right corner or the “close” button in the bottom right corner. The bar that appears with each individual post enables you to interact with each item and to select particular items for publication. The “i” reveals more detailed information about the item, such as the original URL, the date published, the author, and assigned tags. The star is a user-specific feature that enables you to mark particular items that you would like to return to or find interesting, but have not yet determined worthy of nomination. The conversation box refers to the number of comments that have been made on the post. 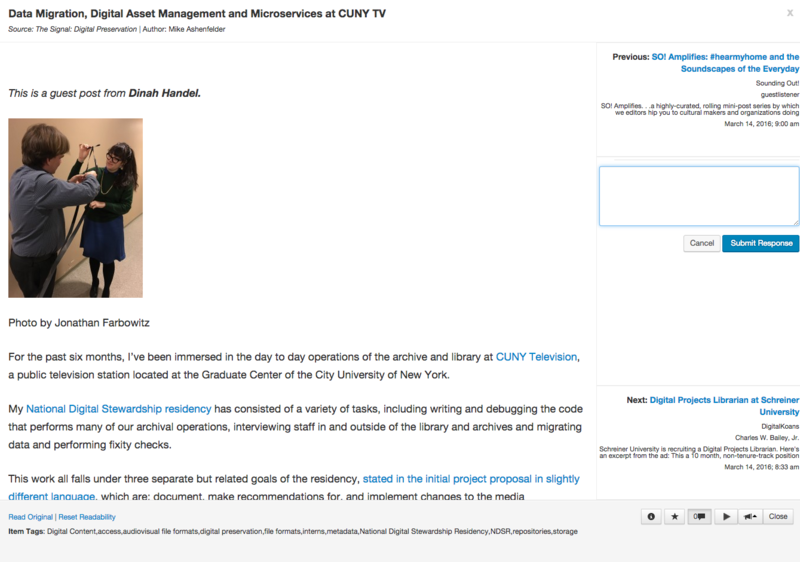 Select the arrow to nominate the piece for publication in Digital Humanities Now. Use the “amplify” button (the horn) to tweet the item. Select “close” to exit the full post view. Of these, the most important button for you as an editor-at-large is the nominate arrow. If the arrow turns green (see below), that item has been nominated by you for publication. You can nominate content in any of the available views. Drag the “Nominate This” button into your browser’s bookmarks toolbar. With your browser open to the content you wish to nominate, click on the the bookmarklet and a popup window will appear with both the Title and Content populated. Enter Author(s) name in the box provided and select whether this is an Editors’ Choice or News nomination in the category box. 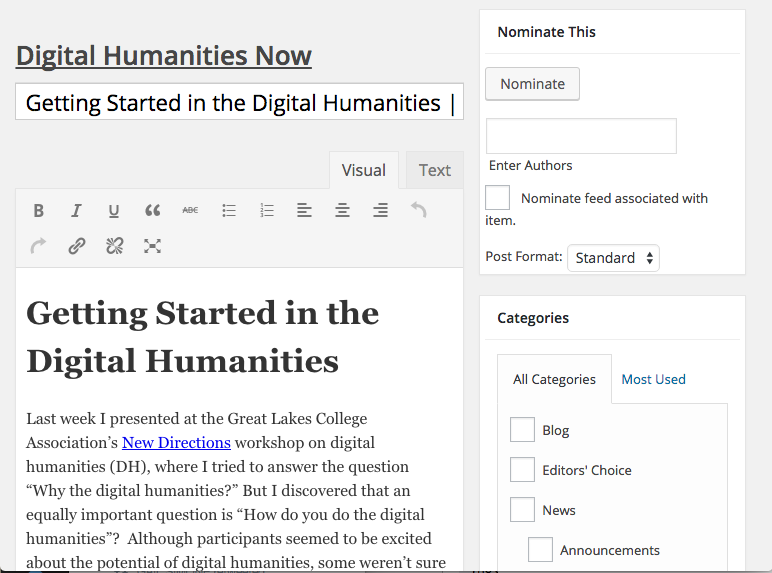 Note: if you are logged out of digitalhumanitiesnow.org, you will need to login in the Nominate This popup window before nominating an item. You can also choose to nominate any RSS feed associated with that item for inclusion in DHNow’s selection of RSS feeds. When you are finished, click on the Nominate button in the top right of the window. 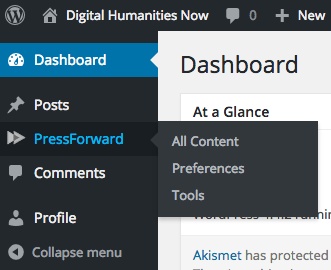 We use the PressForward plugin to review literature for DHNow. If you have any problems with these instructions, or want more detail, read the “How to use the All Content Page” in the PressForward Wiki guide to learn more about how to nominate content for DHNow. Note: We are continuing to develop this plugin, but because it is currently in beta, bugs and unexpected behaviors are, well, expected. You can track our progress and identify known issues on our GitHub page, or see the Support Forum at Pressforward.org.